Engaging members of the community to actively participate in the process of improving the environment through the use of readily available materials like garbage for planting, container gardening, and 3Rs became the focus of Bituen in recent months. Students from Obando, Bulacan aiming to reduce waste and make the river system more liveable. 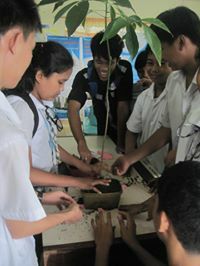 DepEd teachers experience first-hand the joys of turning waste into something useful, to be passed on to their learners. Members of NGO recycle scrap fabric. Bituen partners with NGOs, various government agencies, schools, and business establishments to continuously educate and inspire citizens to become not only vigilant but also active in their duties for their surroundings. To learn more, please call 63-2-9941372 or email us.